The silk-filled pillows you'll see here are filled with luxurious 100% natural and hypoallergenic long-strand mulberry silk wrapped around a pure medium-strand mulberry silk core for perfect firmness. 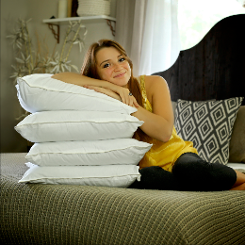 Our mulberry silk-filled pillows are of a medium firmness - as a guide, if you generally use one pillow you will require one silk-filled pillow, if you generally use two you will require two silk-filled pillows. Because it is 100% natural, and of such high quality as not to require any chemical treatment or processing, the silk remains rich in the natural amino acids and the protein sericin that are so good for our skin and hair, keeping our skin young and our hair naturally nourished. All orders are covered by a 14 days full money-back guarantee. Return for any reason, we'll even pay the return delivery fee. We're sure you'll love your long-strand mulberry silk-filled pillows! Mulberry silk-filled bedding and related products are our specialism, we promise you won't be disappointed. These are the very best of the best mulberry silk-filled pillows. There are also some great offers in our sale for mulberry silk-filled bedding sets - combinations of luxury silk-filled pillows, silk-filled duvets, and/or silk-filled mattress toppers. 65cm x 65cm / 26" x 26"